Alaska is the only state where migratory bird and egg hunting is allowed in spring and summer in certain rural areas for subsistence needs. The spring-summer subsistence season was legalized starting in 2003, following amendments in 1997 to the migratory bird treaties with Canada and Mexico. The amendments recognized customary and traditional practices and provide for regulated subsistence hunting of migratory birds and their eggs by indigenous peoples in Alaska and Canada. The Alaska Migratory Bird Co-management Council (AMBCC) was formed in 2000 and comprises representatives of the U.S. Fish and Wildlife Service, Alaska Department of Fish and Game, and Native Caucus, which includes Alaska Native representatives from each of the 10 subsistence regions in Alaska. The AMBCC's primary purpose is to conserve migratory birds through development of recommendations for spring-summer subsistence harvest in Alaska. The AMBCC provides recommendations to the Pacific Flyway Council, U.S. Fish and Wildlife Service, and others for the annual spring-summer subsistence season in Alaska and other topics related to the conservation and harvest of migratory birds. There are about 250 remote communities in Alaska, most of them without road connection. These communities vary in size from a couple dozen to a few thousand people, and largely comprise Alaska Native people. For thousands of years, Alaska's indigenous peoples have relied on harvest of migratory birds and their eggs in spring-summer as part of their seasonal cycle of subsistence activities. Contemporary Alaska Native cultures are supported by mixed subsistence and cash economies. Harvesting and sharing subsistence foods keep communities together. Although Alaska Native people also buy food in stores, harvest still occurs yearlong following seasonal cycles of availability of diverse animals and plants. Harvesting, processing, and preserving animals and plants for food is a lot of work. Thus, subsistence harvest practices seek efficiency in time, effort, and costs. The high cost of harvesting equipment and supplies together with the relatively low income in the villages necessitates efficient harvest practices. Total subsistence harvest of all resources in Alaska is 38.3 million edible pounds of food per year. This is almost 1 lb per person per day, and provides 190% of the daily protein needs and 26% of the daily energy needs. Birds and eggs are a small part (3%) of the total subsistence harvest in Alaska, but they have economic, social, and spiritual value. Harvest of migratory birds at times when few other food resources are available, particularly in spring, ties together the seasonal cycle of harvest until other resources, such as salmon, become available. 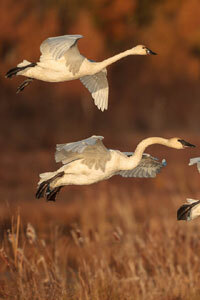 In spring, arriving migratory birds are the first fresh food available after a long winter of preserved foods. 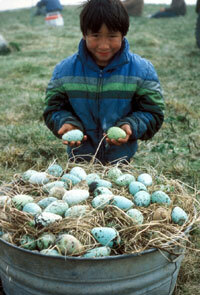 Birds and eggs add diversity to the subsistence diet. 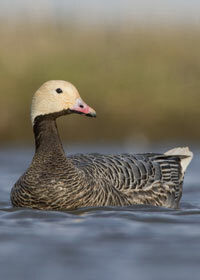 Ducks and geese account for 85% of the subsistence harvest of migratory birds in Alaska. The Harvest Assessment Program (HAP) of the AMBCC documents subsistence harvest of migratory birds and their eggs in Alaska. The survey is based on household in-person interviews and is conducted in collaboration among the U.S. Fish and Wildlife Service, Alaska Department of Fish and Game, and Alaska Natives. Because of low participation of Alaska subsistence users in the Harvest Information Program designed to estimate harvest during the general season in fall and winter, the HAP subsistence survey estimates harvest during fall and winter in addition to spring and summer. Annual reports provide harvest estimates for regions and sub-regions. Subsistence harvest in Alaska accounts for about 5% of the total migratory bird harvest in the Pacific Flyway. The spring-summer subsistence regulations are based on traditional harvest practices with consideration of migratory bird population status and protection of nesting birds. About 92 species or subspecies of migratory birds are open to bird and egg harvest including waterfowl, waterbirds, shorebirds, seabirds, cranes, and owls. The most commonly harvested birds (85%) are ducks and geese, but the intent of having a diversity of species open to harvest is that, in the case of need, people could take other birds without being illegal. There are generally no bag or possession limits to allow for efficient harvest and sharing of resources with family and community. The few hunters in the community share their harvest with non-hunters. Customary and traditional subsistence harvest practices involve concepts of self-limitation, no waste, and harvest goals according to ability to process, preserve, and use birds and eggs taken. Possible dates for spring-summer subsistence hunting are during March 11 through August 31 (migratory bird treaty with Canada). However, season length is limited to 124 days (migratory bird treaty with Mexico), and hunting seasons must be closed during the principal nesting periods (migratory bird treaty with Japan) interpreted as a minimum of 30 days. Considering the outside dates and nesting period closure, the season must be closed for an additional 20 days. The AMBCC recommended that 22 days be taken off at the beginning of the available dates, which resulted in a season generally running from April 2 through August 31 less any closures necessary during the principal nesting periods (see subsistence regulations for region specific seasons). The Pacific Flyway Council works with the AMBCC to develop migratory bird hunting regulations for subsistence needs and coordinate management of migratory birds. Each year, the AMBCC reviews proposals for spring-summer subsistence hunting regulations, and makes recommendations to the U.S. Fish and Wildlife Service. Recommendations from the AMBCC are submitted to all Flyway Councils for review and comment. The Pacific Flyway Council presents the AMBCC recommendations to the Service Regulations Committee (SRC) of the U.S. Fish and Wildlife Service. The SRC reviews the proposals and makes a recommendation to the Director of the U.S. Fish and Wildlife Service who then makes a recommendation to the Secretary of the U.S. Department of the Interior. Approved subsistence regulations are published as proposed and final rules in the Federal Register. Publics may comment on proposed regulations by attending public meetings of the AMBCC, Pacific Flyway Council, and SRC, or by submitting written comments during the state and federal rulemaking process when regulations are proposed. See the Regulations page for more details on the rulemaking process. 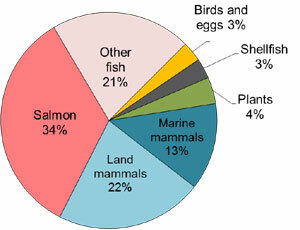 Photo credits: St. Paul Island local with murre egg harvest, Sebert/USFWS; pie chart of wildlife subsistence harvest, J. 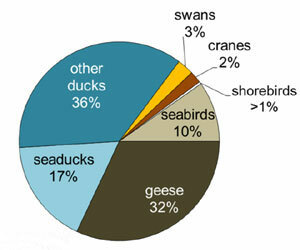 Fall (2016, Arctic 69:47-64); pie chart of migratory bird subsistence harvest, A. Paige and R. Wolfe (1998, unpublished report); emperor goose, M. Burcham; swans in flight, D. Troy.